The FAI has made its submission to world football’s governing body over comments made by Martin O’Neill and James McClean. FAI CHIEF EXECUTIVE John Delaney remains hopeful that Martin O’Neill and James McClean can escape suspensions from Fifa. Comments made by the Ireland manager and his fellow Derry man directly after the recent 1-1 World Cup qualifying draw with Austria have landed the pair in hot water. West Brom winger McClean claimed the visiting team had “a 12th man” in referee David Fernández Borbalán, while O’Neill was critical of the official’s performance and the decision to disallow an Ireland goal. Disciplinary proceedings have been opened against both men and world football’s governing body could either choose to impose bans or go down the less-severe route of fines. 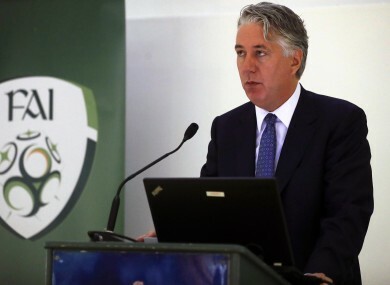 Having submitted a report with its side of the story last Friday, the FAI expect to receive a decision late in the same week as its Annual General Meeting — on 22 July. “It’s an independent Fifa committee,” Delaney said in Dublin yesterday. “I know what I’d give if I was asked to make the decision but I’d be slightly biased. “All I can say is we’ve made our submissions. I think our submission is very much based on people would regret what was said and all that would come of that. I think that’s a pretty fair position for everybody — be it Martin, be it James and be it the association as well. You hope that it’s not matches. I don’t personally think it deserves games. But it’s not my decision. The Boys in Green are well in the hunt for a place at next year’s World Cup with four qualifiers remaining. Ahead of a double-header with Georgia and Serbia at the beginning of September, Ireland sit second and level on points with Group D leaders Serbia. Last September, O’Neill and his management team signed two-year extensions on their contracts to bring them up to the finals in Russia and although Delaney admits deals beyond that point have yet to be discussed, he has praised the job they’re doing. “I think they’ve done really well,” he added. “I know when we started off — with three wins and three draws, unbeaten in six matches in the group that we’re in — people would have been very pleased. “But we haven’t spoken nor has it come up in terms of anything about a renewal. I know there would be a lot trust between the management and association. And to be honest, at this stage, Martin’s mind and the association’s mind is firmly placed on Georgia. “But have they done a good job? No question about it. They got us to the Euros and to the last-16. The FAI’s Financial Report for 2016 was received by members this morning and the association has revealed that it enjoyed a record-high turnover of €50.4 million in the last calendar year. There was €11m earned through the senior men’s team’s participation at Euro 2016, which resulted in a €4.5m profit when you subtract the various costs for player and manager bonuses, travel, accommodation and other expenses. The association’s debt currently sits at €34m, with an additional €5m loan owed to Uefa, and Delaney believes bringing that figure down to zero in three years’ time is a realistic aim. According to the CEO, that wouldn’t rely on qualification to a major tournament and could be achieved via a number of avenues including the re-negotiation of contracts such as the naming rights for the Aviva Stadium, which is up in 2020, Uefa’s TV rights deal and 10-year tickets sales. The decision for the board to make in the first six months of next year is: do we take it [the debt] all the way down, some of it down or leave a substantial amount of debt and reinvest it in the game?” he said. “When you do the numbers even on the back of an envelope, and we’ll do them in more detail at the AGM, it’s easy to see how we can generate €34 million to take our debt down to zero by 2020. Email “'I know what I’d give but I’d be slightly biased' - Delaney calls for leniency from Fifa ”. Feedback on “'I know what I’d give but I’d be slightly biased' - Delaney calls for leniency from Fifa ”.